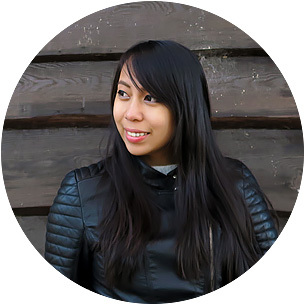 Hey Aileen, I love your blog! I have been a follower for a while now so let me tell you this: I always enjoy reading your posts and I love your blog’s design too! Keep it up, girl! You really inspire me a lot and right now, you inspired me to do one thing that I have been postponing for years… I want to know how to start a travel blog or just how to start a blog . If you don’t mind, can you share some tips on how I can start? I’m not so good with these things. I don’t have any idea to be honest and I would really appreciate your help if you have the time. Thank you very much! I get a lot of messages like this, especially after I announce on Facebook any recent partnerships that this blog has made with brands, hotels, airlines, or tourism boards — travel blogging can really offer a lot of ‘perks’ and it can help you fund your travels too! So I can definitely understand why you would want to start a similar thing for yourself. To help you on how to start a travel blog, I have finally put up this detailed step-by-step guide that is not only easy to follow, but also easy to understand. NOTE: Actually, this guide does not only apply to aspiring travel bloggers… since the steps below can also apply for other kinds of blogs that you might want to start: art, beauty, fashion, lifestyle, photography, sports, tech, etc. I have a lot of experience on blog or website set-ups (it’s a part of my online work before) and most of the work that I’ve done were complicated things… but don’t worry! In this article, I will pick the easiest and most efficient platform for starters like you. I will even try my very best to simplify every technical term and process! Just remember though, that even if learning how to start a travel blog can be easy (since I will help you out on that with this post), maintaining a travel blog is a different matter of its own — it’s definitely not a walk in the park. It requires a certain level of commitment and it can be tough, but if you do it right and do it well, it can be a venture that’s really worth your time. I can’t exactly say that I’m a big travel blogger but I’ve had some great accomplishments that made me gain a lot of insight into this ‘travel blogging’ thing. And since I love you guys, I will include bonus tips in this article to help you put your travel blog under the spotlight! NOTE: It can be a challenge to do travel blogging if you are having a hard time figuring out how you can live a sustainable travel lifestyle. In case you have this dilemma, don’t fret! Just go and read my past articles below and you can certainly jumpstart your own travel lifestyle! Step 1: Find your niche. Well, yes it is, but in order to attract a reasonably good audience right from the very start, you would need to establish yourself as an expert of a more specific field. Surely you can talk about travel as a whole, but as a ‘newbie’, it doesn’t help to market yourself as someone who is knowledgeable about all aspects of travel— that won’t attract anyone to your website since they can just go to bigger websites like Lonely Planet or Nomadic Matt for travel tips. To illustrate this further, let’s say you started off with posts about budget travel… Over time, you have somehow attracted some readers. Good job! But then the next week, you decide to talk about luxury travel. With this scenario, there’s a high chance that you will loose a certain chunk of your audience, and if you continue to be finicky about your topics and your expertise, you will continue to loose a number of people. Fast. So take my advice: save the grand mix of travel tips/articles/guides/etc. once you get to be a bit bigger with a more ‘entrenched’ audience that is interested in you as a travel blogger. As an example, let’s take my blog, ‘I am Aileen‘. It initially focused on inspiration for starting a travel lifestyle no matter your life circumstances (this is what helped me gain readers as a newbie blogger in the past). Today, I focus more on my sustainable travel lifestyle and the travel tips + resources that I find and use as I continue my travels. Step 2: Brainstorm a kickass blog (domain) name! To put it into simple words, a domain name is the unique ‘address’ of your blog on the internet. For instance, this blog’s domain name is iAmAileen.com and it will remain to be my unique identifier for as long as I continue to pay an annual fee. Yes, a FEE. To be able to get these .com names, you would have to pay — rest assured, these things come at a very cheap price of only $14 or Php 700+ per year (yes, it is that cheap! 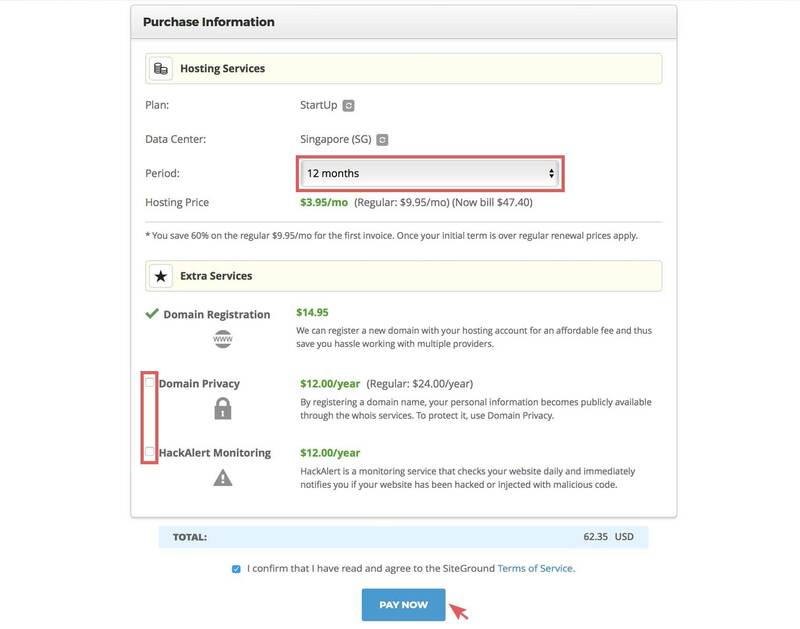 I will discuss this in more detail in point #3 since apart from the domain name, you also have to pay for ‘hosting’; rest assured, it will still be at a very affordable price). They take some time to type! Think: yourtravelblog.blogspot.com versus yourtravelblog.com – the second one is better, right? Avoid hyphens or numbers since you risk people typing it out wrongly when they spread your blog’s name by word of mouth. Avoid words that are not easily recognized or spelled by other people (especially words that are not in English, unless of course you want to focus only on audiences in your home country). Check if it’s good when combined together. Example, if you pick a name like “Speed of Art” if it’s squished up as a website URL it will look like: www.speedofart.com — you wouldn’t want that, would you? This will be the name that you will be introducing to others in the future so make sure it’s something that you like, love, and are proud of. Try to make it related to travel. Don’t follow my example unless you’re really stubborn. (IRRELEVANT TRIVIA: I decided to stick with my blog title, ‘I am Aileen‘, since I still have that *funny* lifelong goal of making ‘Aileen’ a well-known name worldwide that is not, in any way, related to the famous murderer, Aileen Wuornos). Anyway, it’s important to have a travel-related name because apart from the fact that you have to market yourself as a travel blog, you also have to mind your blog’s ‘standing’ on search engines and having a name that’s related to travel will hugely improve your whole site’s SEO. What is SEO? It’s short for ‘Search Engine Optimization’ and it’s an important aspect that every website owner should know of in order to increase their number of visitors, as well as their visibility on search engines like Google, Bing, Yahoo, etc. If you want to learn more about this, you can go to Moz or SearchEngineLand — they offer great free courses for SEO beginners like you! Try to be unique and original. Go and play around with a combination of words; use a thesaurus if you need to! Mix it with your name or nickname. Invent a word if you have to (but make sure it’s an easy word). You can definitely go for SEO-friendly titles like ‘Solo Backpacker’, but then it’s so generic that people can easily forget your blog. Make it timeless; think long term! Your name will be your brand forever, so don’t tie yourself with a current trend that’s bound to fade away. If you don’t intend to travel as a backpacker forever, don’t choose a name that will suggest that, or you’ll find it a bit hard to score with bigger luxurious hotels in the future (for example). Don’t come up with something like ‘365 Days of Travel’ if you plan to keep your travel blog for more than a year. Don’t use ‘Teenage Traveler’ since, well, you are going to get old… but then again, it can be quite charming, so it’s up to you. Consider that if you put ‘The Philippine Nomad’ they might think that you’re just concentrated on the Philippines — unless that’s what your travel blog is about. Check its availability. Once you have a name in mind, check if it’s available as a .com address (go to Siteground to check this, and don’t mind the prices that you’ll see there because with my guide on step #3, we will process your domain later on; we’re just doing this step so you’ll see if your name idea is available or not). If your idea is still available as a domain, next, you should check if it’s available across all social media channels to also ensure that the username is not taken yet; to do this with ease, use the website KnowEm. Google your phrase. Use quotation marks (“your blog name“) to see if someone has used your name already on another site, or if it’s related to some shady site. If you’re in the U.S. and planning to register your blog as a business in the future, check if your name is trademarked. You can check this by going here. Step 3: Buy your domain name and get a good hosting for your travel blog. A host or hosting is basically a service that you need to avail in order to reserve your spot in the internet — it’s a place that hold’s all your blog’s data, posts, photos, and more. This means that once it’s connected with your domain name and someone types it out on their browsers, your hosting will be the one that works to quickly display your blog to whoever ‘called’ for it. So where can you get your hosting? There are a LOT of providers out there. For example, I bet you have heard of HostGator as it is one of the most popular ones. BUT heed my advice: Don’t. Get. Them. I’ve been their customer for years and I encountered far too many problems with their hosting plans — they suspend my website for no reason and with no prior notice, the customer service takes soooo long to reply, live chat was almost like a ‘no chat available’ service, website loading times are slow no matter the optimizations I make, etc. etc. etc. It was the last straw when they suspended my account again earlier last year so I took the steps to find a better host — which I gladly did, and I am very contented with SiteGround! I absolutely recommend them to anyone. Why so? They offer quality hosting for a VERY affordable price. One other hosting provider that I have been considering was BlueHost but I have found out that they are related to HostGator (they are owned by the same company) so that reduced my confidence in them. I have even heard of friends that had problems with BlueHost suddenly going down, etc. so because of that and more, I decided not to go with them. SiteGround on the other hand, rarely has down times! They have superb security protocols, lightning-fast loading times for websites, and my travel blogger friends recommend it too. What’s more is that they are cheaper than BlueHost! For a basic plan in SiteGround, it can only cost $3.95 (Php 175+) per month! Are you excited yet? I am for you! They have amazing customer service. You can just ask them anything and they will do their very best to assist you – ASAP. In fact, they are the most responsive team that I have ever encountered! They have a ’24/7 Live Chat’ feature too, and unlike HostGator, they have virtually NO hold time. I NEVER had to wait for too long. To start with SiteGround, simply follow the steps in the expandable section below. (To view the section, simply click the symbol ‘+‘ — I’ve made it this way since the steps are lengthy and I didn’t want it to take up too much space on this page). NOTE: If this page that asks for your domain name doesn’t show up during your order process, don’t worry, it will show up later on during the ‘Website Setup Wizard’ (discussed in a while). Seemingly, order pages tend to change layout depending on your location. Meanwhile, if you already have a domain name registered elsewhere or if you already have an existing website, transferring it to SiteGround is also FREE once you sign up with them. The things that you have to take note of here is first, the “Period”. If you have the money to spend, I suggest that you go for the 36-month option in the dropdown selection since it’s the maximum plan that you can get wherein you can enjoy the 60% discount (after the 36th month, as you renew, you will still get a discount but it will be a lot lower). However, if you can’t afford the total bill for a 36-month, the 12-month option should be fine for a start. 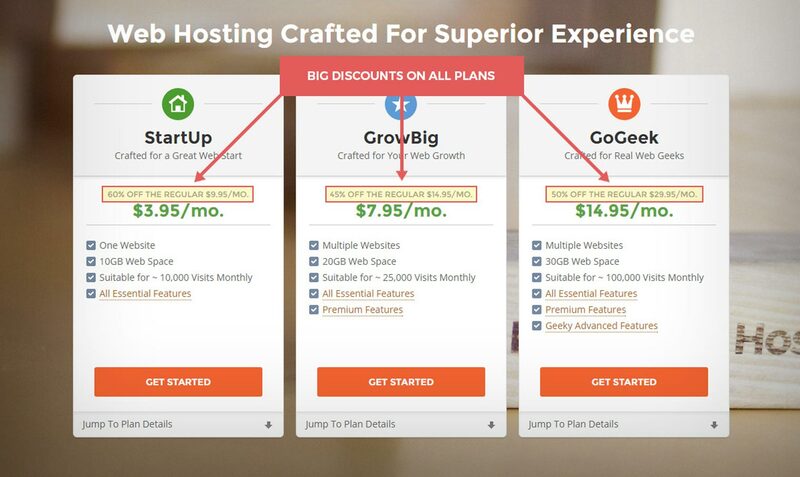 (This is a common discount scheme across all hosting providers; the difference though is that with SiteGround, it already gives a huge standardized discount for any length of period, whereas other providers only put a huge discount if you pick the longest period). HackAlert Monitoring: for added protection from malware, hacking, and more — this is an extra that you would like to avail. Finally, once you’ve decided on the extras that you’d like to avail, click “Pay Now”. Once that’s processed, you now have your hosting account set up! …But we’re not done yet. Continue reading to the next step which will teach you how to put up your blog through WordPress! I am talking about WordPress.org which is different from the free platform, WordPress.com. Now don’t worry since I will guide you well on how to install this on your hosting in SiteGround; just remember that WordPress.org is your savior and it’s the best platform for a beginner like you — in fact, it is used by big websites like BBC, CNN, and New York Times! How to install it? Simply follow the steps in the expandable section below. #1. After placing your order previously, you should have received an e-mail notification confirming your registration with SiteGround. There will also be a separate email that will give you your username and password details. In each of these emails there should be a link that says “My Accounts”. Click that (or just simply go to SiteGround and log in). #2. Once you log-in to SiteGround for the first time, you should see a page that looks like the below. It’s called as the Website Setup Wizard. 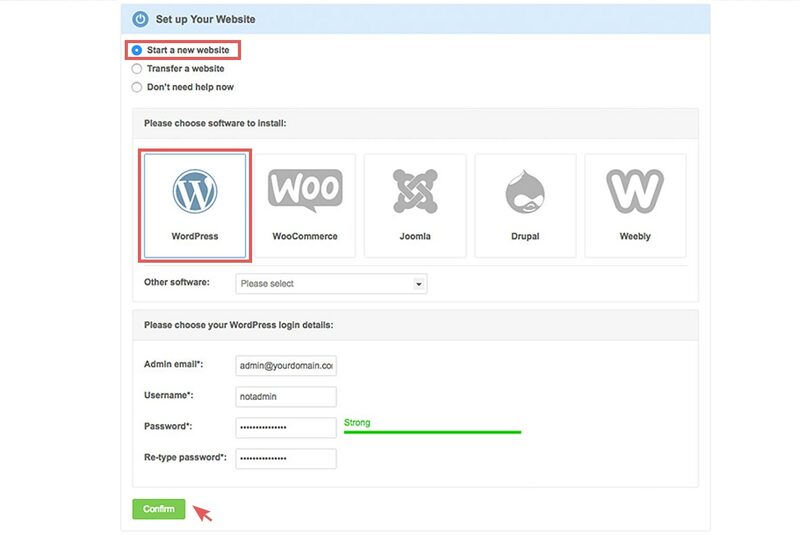 Make sure that you select “Start a new website” and WordPress as the software — this easy installation process is great since it saves you the hassle of going through the more technical side of things. Below it is the section where you will create your WordPress login details for your travel blog. First, enter your personal email address that will be attached to your WordPress account. Second, create a username — I highly suggest that you don’t use easy usernames like ‘Admin’. Pick a unique username to deter any hacker that might want to log-in your blog. Third, create a password — make it as complicated as you can, much like your username, but make sure that it’s something that you will remember since you will use it every time you log in to your WordPress blog. NOTE: If in case SiteGround shows you a page asking if you would want to choose and pre-install a free or paid WordPress theme (design layout for your blog), I recommend that you don’t select any of these options and just choose that it pre-installs a simple default WordPress theme for you. I want you to do this because there are a LOT more better themes online that you can choose from and I will discuss it in more detail in #5 of this article’s step-by-step guide. (However, if you find yourself loving a certain theme here on SiteGround’s page, feel free to select it so that it will be installed). Also, like I mentioned previously, in case your order page process doesn’t show the domain registration section, it should show up by this time, looking like the below. #3. The next page will give you the confirmation of your WordPress set-up, along with the details of your blog’s log-in URL (bookmark this in your browser so you don’t have to type it out every time), as well as the username and password that you have previously set. Aaaand woop, congratulations! You now have your .com travel blog up and running! Next up — tweaking and designing it! WordPress is pretty straightforward and it’s very easy to use but if you ever need guides on how to use it, you can always check out FirstSiteGuide’s tutorial or from WordPress.org itself. (Otherwise, you can always strike up a conversation with SiteGround using their ‘Live Chat’ feature and their representatives can always help guide you on your issues). BONUS: In order to help you look like a ‘professional’ and serious travel blogger, you would need your own .com email and it’s pretty easy to set up with SiteGround. Just follow the easy steps below! #1. Make sure that you have a Gmail account because in this guide, I will help you create a custom email for your domain wherein all incoming and outgoing messages can be simply handled by your Gmail account alone. #2. Go to your SiteGround’s User Area (which should be located here) and click the tab: “My Accounts”. In here, you will see a red button at the top that says: “Go to cPanel” click that and a pop-up will appear. Just click “Proceed”. #3. Scroll down and find the section below: “Mail” and then click on “Email Accounts”. #4. For Email, you are free to choose whatever name you wish. Example, it can be info for [email protected], or your name, etc. As for the password, it doesn’t need to be too complicated, we only need this one for the set-up with your Gmail account so take note of it. Once done, click “Create Account” and that’s it! #5. Go to your Gmail account. Click the gear icon on the upper right corner and in the drop-down list, select “Settings”. #7. A pop-up should appear. Enter the full e-mail address that you have set up on SiteGround (example: [email protected]) and then click the button “Next Step”. NOTE: For POP Server, please double check your SiteGround account since this detail could differ as depending on your plan and location. To verify this, under your email accounts in your cPanel, click “More” on the corresponding email that you have created and select “Configure Email Client“. A new page shall show you the details of your email configuration. Scroll down to see the section “Manual Settings” and here you will see your server details. Whatever information you see under the highlighted section in the image below should be the data that you use for POP Server. #9. The next window will ask if you would like send mail as [email protected], go and click “Yes, I want to be able to send mail as…” This setting will enable you to write messages in your Gmail using your customized .com email; so in the next page, enter your full name in the “Name” field, and then check the box for “Treat as an alias”. Click “Next Step”. NOTE: For SMTP Port, remember my note in step #8. Use the data that you see on your email configuration details. (This typically is the same data that you entered for your POP Server). For this confirmation, you should receive an email in your Gmail account (it can take a while to come at your inbox so be patient). Once you receive the confirmation email, to verify, you can either click the confirmation link or input the confirmation code into the still open popped-up window. I advice that you just do the code method — past the code in the box, click “Verify” and… you’re DONE! You now have your own customized email for your domain name! Step 5: Pick a theme, customize your site, and add plugins! Time for us to make your blog shine, identifiable, and awesome! » Where to get great WordPress themes? » I’d like to have a nice logo, how can I make one? Or better yet, have you heard of Fiverr? It’s this awesome site where everyone offers every kind of service there is for only $5 (Php 220+)! There are some bad ones but there are good ones too, and it’s easy to weed out the ones that don’t give quality work. » What are WordPress plugins? Do I need them? Oh yes, you do! They will help a lot in spicing up your site — just think of them like apps that will help your travel blog perform and look better. To start, below are the free WordPress plugins that I recommend which you can easily add to your blog by going to your Dashboard: click ‘Plugins > Add New‘. In the search box, type the plugin names below and click ‘Install‘ as needed. WPTouch – only if your theme is not responsive (or mobile-friendly) this is the plugin for you! Google Analytics – this is an important thing for you to set up! Google Analytics (GA) is a powerful tool that helps measure and analyze your blog’s traffic; in the future, advertisers would need data from this platform. So first, you need to register with GA and then install this plugin to easily integrate GA’s tracking with your website. TIP: If you plan to add more plugins than these, try not to install too many since it can slow down your website. Take advantage of SiteGround’s speedy loading time by activating their FREE ‘SuperCacher‘ plugin. To enjoy this feature, make sure that you enable ‘Static Cache’ by following the instructions on this page. After which, you should enable ‘Dynamic Cache’ (follow the steps here). Lately, Google is starting to prefer websites who are set to “https” — which signifies that you have a secure website. To enable this for FREE on your domain, just follow the steps here. If you ever encounter any problems, feel free to chat with the SiteGround team and they’ll be more than happy to assist you. Step 6: Create the ‘basic contents’ and start an email list. » What do I mean by basic contents? About – introduce yourself, better if you can make it very engaging in order to make people want to follow you. Contact – it can show your email and social media channels, or you can opt to put up a form using the plugin Contact Form 7. Others – as you grow, you might need other pages like what my blog has (example: Archives, FAQ, Press, Travel Destinations, etc.) and it’s totally up to you if you want these or not. To learn more about pages, check here. Footer. This is the bottom part of your page and you can do whatever you want for this. Some people simply leave it blank, while others include things like ‘As Seen On…‘ (which I also have). If you want more inspiration for stuff to display here, simply browse through other travel blogs for ideas. About – Make it very brief or catchy, and then include your photo on it along with a link that leads to your about page. Newsletter – Encourage people to subscribe to your updates, this can be made possible if you sign up for MailChimp (which I will discuss below). After your registration, display a newsletter sign-up widget on your sidebar by installing this plugin. Social Links – Promote your social media accounts! You can choose to show big boxes like this one by Facebook or you can use icons that would link to your account by using a plugin like this. Popular Posts – to help direct your readers to your other articles, download this plugin and display its widget. » How to start a travel blog email list and why is this important? Like what I’ve mentioned above, you can create your own mailing list or newsletter with MailChimp which comes FREE with a maximum number of 2,000 subscribers — a pretty good deal! It is important to have this because though people commonly use social media, they still use their emails too and prefer to be notified or updated through it. For this reason, you should take the chance and create one! Besides, it will help a lot in the future whenever you will have giveaways, contests, or products to promote since you can also track email opens, conversions, and more! ANOTHER OPTION: You can try Aweber which is a lot cheaper than MailChimp especially if you hit the 2,000th mark! However, at the very start it wouldn’t come free — you will only have a 30-day trial, after which, you’ll start paying for your ‘plan’. The costs are cheap though especially if you’re starting, but if you’re a cheapskate like me, MailChimp can already be a good start! Step 7: Time to secure your name on social media channels. NOTE: Better to create a page for Google+ since a personal profile will typically use your full name, whereas for pages, it gives you more of the ability to create it with your blog name and thereby resulting to a suggested URL from Google that’s close to your blog’s title. Step 8: Start creating your content. Create original and engaging content. Your first post can be about who you are, where you are, what you aim to do etc. If you still haven’t started traveling yet, it will be awesome if you can start to talk about your plans and how you aim to achieve it; make your audience a part of your journey by sharing your whole experience right from step number one! Once you start hopping around the globe, your posts can be about current/future trips, travel tips, inspirational articles, and more — all depending on the niche that you have decided to concentrate on. If you want to know more article ideas, you can refer to Girl VS Globe’s 50 Travel Blog Post Ideas! Try to post regularly. It does not only keep your readers updated but it also helps your Google rankings (as it will notify the system that you post regularly). I recommend posting at least 3 times a week; but eventually, you will get a feel of the number of times that you have to update so this frequency can go higher or lower. For instance, some bloggers have marketed themselves as Thursdays-only and that is quite a clever way to keep your readers coming back on a certain day. Quality is always better than quantity. Tons of content won’t matter at all if they’re not good nor meaningful. So how can you make great content? Through practice and research. Try to see what the other big bloggers are doing – draw inspiration from them! Ultimately, just tackle the topics that you would personally want to read or know about if you were to place yourself in the shoes of your readers. Remember that success through your content won’t happen overnight. It will take time and you need to have patience. Like most success stories, you must have the commitment and drive to stay dedicated to your cause. Take my example: last September 2014, after I stabilized my travel lifestyle, I relaunched this domain — I started from the ground up to make it focus solely on travel and inspiration. It has been 6 months since then and even if I have managed to snag big deals with influential brands and got featured in huge online websites, I still think that I am still on the ongoing process of making this blog successful. Day by day, it really involves a certain degree of hard work and if you can find a balanced system for improving your blog, the results can be very rewarding. For more information on how you can create great content, see FirstSiteGuide’s tutorial. NOTE: If you have set up a blog before in Blogspot/Blogger, you can always import your old posts to your new WordPress.org blog. Simply follow the instructions in this page. Though if you have rather set up a blog previously with the free platform WordPress.com, Siteground can easily import your posts for you so no worries there! Just contact them about it. Step 9: Promote your travel blog’s name and articles. As a beginner, I know how hard it can be to figure things out. So in order to aid you further into this ‘online abyss’, here are tips on how you can promote your blog in order to build an audience and create a dedicated network! I have made you sign up to all those social media channels, but it doesn’t entirely mean that you have to be fiercely active across all platforms. You can post to all of them of course, but sometimes, it’s best to focus only on a top 3! So why did I make you register to ALL those social media channels? At the beginning, I need you to play around with all of them, and as you continue to blog and share your posts through these channels, you will eventually figure out the top 3 channels that you need to focus on. In time, you will also gauge the best times for sharing as dependent on your followers’ behavior and more. TIP: Feel free to survey the other successful Facebook pages related to your niche so you get to have an idea about the kind of posts that work for them. It also helps to create a schedule or checklist so you are focused on the social media sharing that you have to do after every blog post. You can even try approaching big Facebook travel pages to ask if they are willing to share your post! For more information and tips on social media, you can check out Legal Nomad’s post. Connect with travel bloggers! Don’t be shy, most of them want to connect with you so feel free to message them. (Don’t be shy in messaging me too!) Otherwise, you can comment on their blog posts to build rapport, relationship, and engagement. Try to find bloggers who are open to collaboration posts, guest posts, or interviews (sometimes these opportunities can be seen in the Facebook group I previously mentioned or you can simply browse a travel blogger’s website to see if they are open to these kinds of things — send them an email if needed). For instance, some of my interviews on other famous blogs of other travel bloggers have happened after I reached out to them (example was my interview with Nomadic Matt). Consider submitting content to bigger websites like Thought Catalog, Matador Network or Huffington Post. Trust me on this one: if you become very active in pitching your unique story or experience to big websites like these, you will easily skyrocket to online fame! To search for more websites that are open to article submissions, just search for them through Google. Be mindful though that there are websites that can be tough to ‘get into’ but it’s always worth a try to get your name or face out there. For other ways to promote your content, see FirstSiteGuide’s tips. Otherwise, do you want me to promote you on my sidebar? See here for more details. 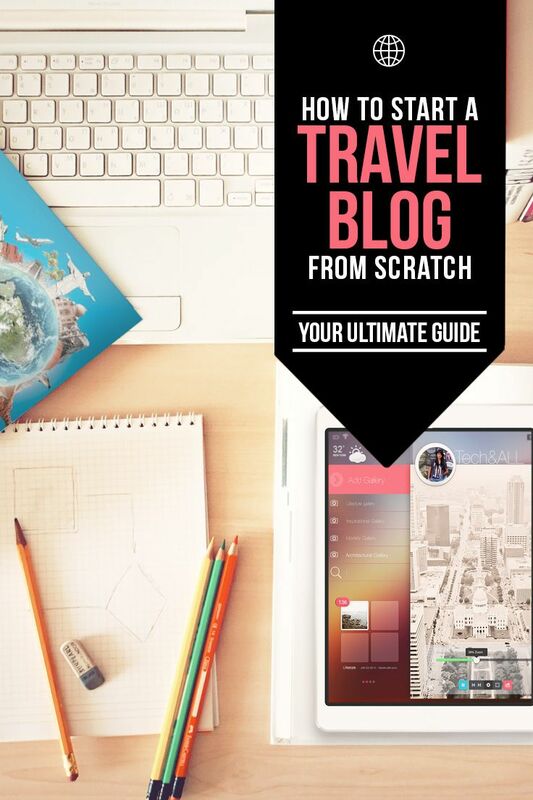 Step 10: Monetize your travel blog and reap the rewards! One of the advantages to creating a blog and owning it? The numerous opportunities and ways for making money! I clearly started this blog as a hobby (and more of a personal diary; which you will see if you scour the far pages of this website) but after redefining my brand, I started to get recognition, I started to earn a bit and eventually the opportunities that I gained have helped me in one way or another to fund my travels — to sum it up, this took me months. Amazon – for travel gear, etc. TIP: As you’re still starting, please don’t go overboard in monetizing your blog, or else, some of your readers will be put off by let’s say, the gazillion of banners that you will be putting up on your site. What can you do then? Take it slow, be picky, and only put up the kind of ads that can best fit your audience. NOTE: If you focus on doing travel vlogs (video blogging), YouTube’s partner program works alongside Google AdSense for monetization, so make sure that you enable that. Finally, this isn’t exactly ‘monetization‘ but gaining free or all-expense-paid trips are one of the benefits that you can get from travel blogging. Once you have earned a good amount of readership (as evidenced by your website’s stats and social media followers) you can use this data to pitch your blog’s influence to hotels, tourism boards, airlines, and more! Sign up for the Gmail extension: Sidekick! Make sure that you register through this link so you can avail the sign-up bonus that includes a 1-month package of FREE unlimited notifications — don’t worry though because after that, your account will still stay free. You’ll only just be limited to 200 notifications a month, which is still technically good! Now why am I recommending Sidekick? Because it notifies you whenever someone opens or clicks on a link on your email, and that helps a TON! For one thing, it will aid you in estimating the time that you can send another email follow-up. (For example, since you clearly know that they opened your email, you can try following up 3 days after they opened it; otherwise, if they haven’t opened it at all, a good rule is to follow up after a week the first time you sent it with a max number of follow-ups at 3). As long as you have an engaged audience, you’re good to pitch! There really is no magic number to knowing how big you have to be in order to be ‘eligible’ enough to pitch with brands; but I guess… surely a monthly visit of 1,000 and a total of 100 social media followers won’t do the trick. Anyhow, what’s mostly important in order to ace a partnership or sponsorship is to show that you have an engaged audience, and that you have a blog that is fit for the brand’s needs. Do your own research. Find the appropriate marketing or press contact(s) on the website. If you really can’t find one, simply contact the generic address on the website to ask for the correct email that you can send your message to (or send them a message via their social media page). You can also simply write your proposal and ask them to forward it to the right person! Target brands that are evidently concerned about social media. It helps to partner with brands that are active on social media because that gives you the assurance that they are interested in growing their online followers (which you can try and help them with). Be convincing, direct, and honest. Be clear about your request right from the subject and first sentence of your email. Assure them on how you can grow their customer base or online exposure — basically on HOW you can help them. If you have a unique campaign that you think you can tailor well to their product/service, then don’t be afraid to pitch it! If I may add, it also helps to have a media kit to quickly show your website’s stats. (See media kit examples here). If you’re not good with Photoshop, try out Canva.com which is very easy to use even if you’re not good with graphic design. You can also just hire people to make it for you — like me!. My site’s design here is one example of how I usually do my web design work, otherwise, you can visit my portfolio page. NOTE: Don’t go crazy! Don’t pitch to every company that you know of. You still have to make sure that the company that you are trying to partner with is relevant to your blog. I tried my best to be as detailed as I could and I dearly hope that this helps you learn how to start a travel blog successfully. Good luck! P.S. Please feel free to message me if you have any questions. I would love to help you out for as much as I could. I’m not a ‘big’ travel blogger yet but I’m trying to make my way there, and in the spirit of sharing (since I perfectly know that this journey can be really hard) these are tips that I have learned over the years that helped usher my mini achievements — which I hope would help you too! Disclaimer: Some of the links on this article, ‘How to Start a Travel Blog’ are affiliate links. This means that if you click on a link and purchase any of the products/services that I recommended, I will then receive a small commission that is at NO extra cost to you. Still and the same, I only recommend brands that I personally use or believe in that have helped me in my blogging career. Hope you enjoyed this ‘How to Start a Travel Blog’ post! If you’re a newbie, did you find this post helpful? What other things would you like to know on how to start a travel blog? If you’re an experienced travel blogger reading this post, do you have any other ideas to contribute on how to start a travel blog? I (we) would love to hear them! This is the ultimate guide Aileen. I really like reading your style, I was just here earlier reading about your Batanes post, nakakamiss ang Batanes :). Anyway, this guide is also helpful for non-travel bloggers. One great tip is get a really reliable hosting, there are cheap ones out there but it's not that dependable. And yeah, we always need reliable hosting and a cheap one too; which thankfully, SiteGround has. I will never support HostGator and I will stand by my word -- I really had a horrible time with them. This article was perfect timing for me! I'm planning to tackle the first few steps today after returning from a short trip yesterday. Ticked off my 66th country- wish I had of started this blogging journal earlier! Thanks for sharing all this great info! Really? That's great to hear, Brenda! :D Let me know if you need any assistance, good luck! So many wonderful tips in here. I only wish I knew most of this before I started. Wishing all new travel bloggers well!! Any tips on what to put in the blog prior to traveling? I've already decided to travel but I'm still in the saving phase. I want to start a travel blog prior to traveling so that I already have a blog the moment I travel. And I wish you the best of luck!!! I have read a few 'how to start a blog' posts but I think this is by far the best one I've read! Thanks for taking the time to write and share! Aw, thank you Nigel! I'm really happy to hear that. :) And I hope this helps you out. I wish you happy travels and happy blogging, keep up the good work and don't stop inspiring us! Thanks Sab! I'm glad you liked it! :D And yeah, you should update that, haha! I wish you the same -- let's both keep inspiring! Some great tips here Aileen and even though I've been blogging for some time now, I still picked up a few new ideas.